I am very pleased to announce that Brooke Carrigan and Connor Pullinger have been appointed as the College Captains for 2019. Brooke and Connor are very excited by this opportunity, especially as we come together as One College. They are genuinely focussed on servant leadership and taking on the new responsibility of caring for our Reception to Year 5 students. 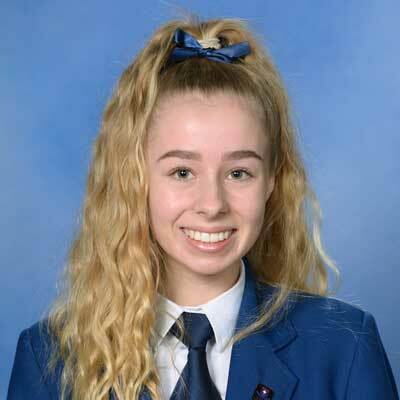 The field of candidates for College Captains was particularly strong and we now look to ways in which all the Senior students with leadership aspirations can serve our community. Our other Senior leadership appointments in the areas of The Arts, Sport and Community Captains will occur in the coming weeks. Recently, I had the opportunity to attend a breakfast meeting with the UniSA Vice-Chancellor, Professor David Lloyd. This was a chance for Professor Lloyd to inform schools about the strategic direction of the University. This included a short discussion about the amalgamation of the University of Adelaide and UniSA which has been in the media in the last two weeks. In addition, Professor Lloyd was able to share ideas about student pathways and success at university, the debate over Australian Tertiary Admission Rankings (ATARs) and the need schools have to access high-quality graduate teachers into the future. I was pleased to hear of the discussions within UniSA that look beyond ATAR’s as the only measure for university entrance. UniSA is seeking to broaden its approach to entry with the potential for a student’s research project, community service, and extra-curricular involvement being considered as measures that could indicate the potential success at the undergraduate level. 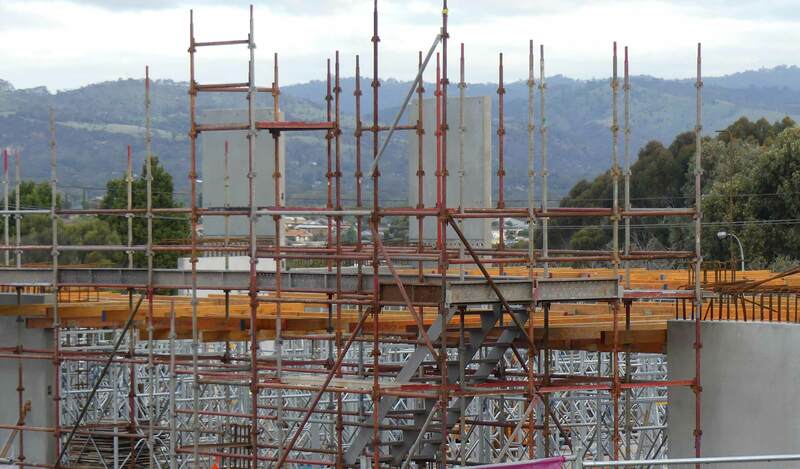 This endorses the approach Pedare has developed through the IB PYP, MYP and SACE programs. 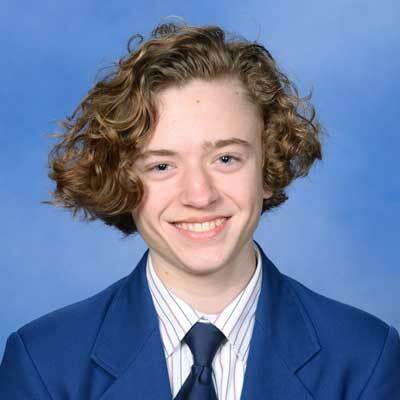 Pedare’s focus on developing research skills via the PYP and MYP enquiry units, the MYP Community Project and the Year 12 Research Project allows our students to move confidently to the tertiary level. In addition, we want students to be actively engaged in the full life of the School. We want student involvement in community service and Music and Sporting programs to gain the skills the university is seeking for entry. 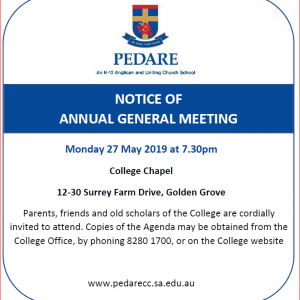 The message into the future is clear, Pedare students will need to take up all the College’s opportunities in a balanced way and give themselves every chance for successful entry to tertiary courses. 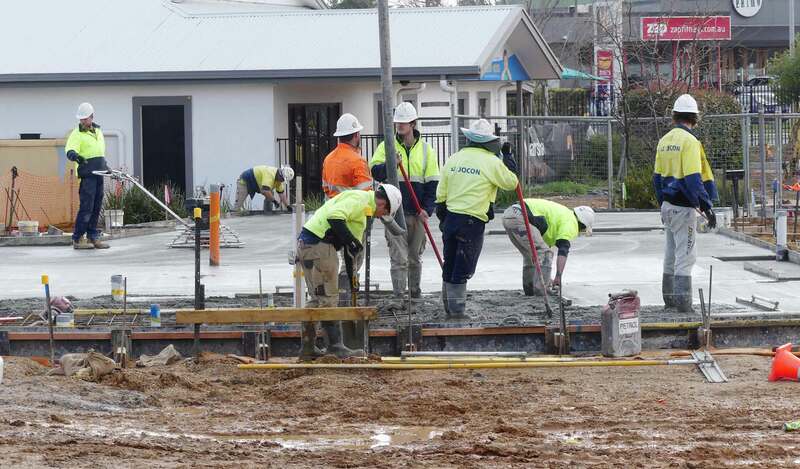 Preparations are underway for the next concrete pour in the Middle School building. As a Candidate school for the Primary Years Programme (PYP), there are terms and phrases you may be unfamiliar with. One of the essential elements of the PYP is ‘concept-based learning’ which I thought I would like to share with you. In the Primary Years Programme, concepts and conceptual questions drive the way we teach and learn in a transdisciplinary context. Conceptual learning goes beyond “subject learning.” Concepts are powerful, broad ideas students explore and re-explore during their education. This helps them develop an in-depth understanding of the world around them. In a traditional classroom, students may learn about animals and animal characteristics. In a PYP classroom, students might learn about the concepts of adaptations, change, and interdependence. 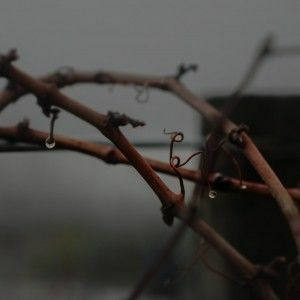 To develop their understanding of these concepts, students would still learn about animals, but they might also look at human and plant adaptations, how living things change, and interdependence within multiple living systems. Furthermore, across all of the IB programmes, eight key concepts are recognised as having universal significance within curriculum models. These key concepts are significant to the planning of the Units of Inquiry. Within each Unit of Inquiry teachers select a few key concepts to develop and extend the student inquiries. Within each year level, all the key concepts are addressed during the school year. 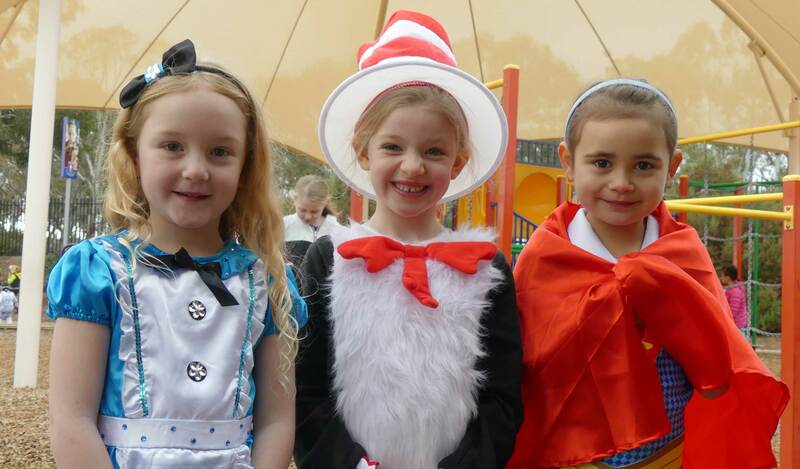 At the heart of the Primary Year Programme’s (PYP) philosophy is a commitment to structured, purposeful inquiry. The inquiry often transcends traditional subjects and through this process students develop an understanding of important concepts, acquire essential skills and knowledge, develop particular attitudes and learn to take socially responsible action. Last week the Alannah and Madeline Foundation presented to our Year 8 students on the topic of online safety. For many parents, the issue of keeping their children safe when they are using the internet is an important one. 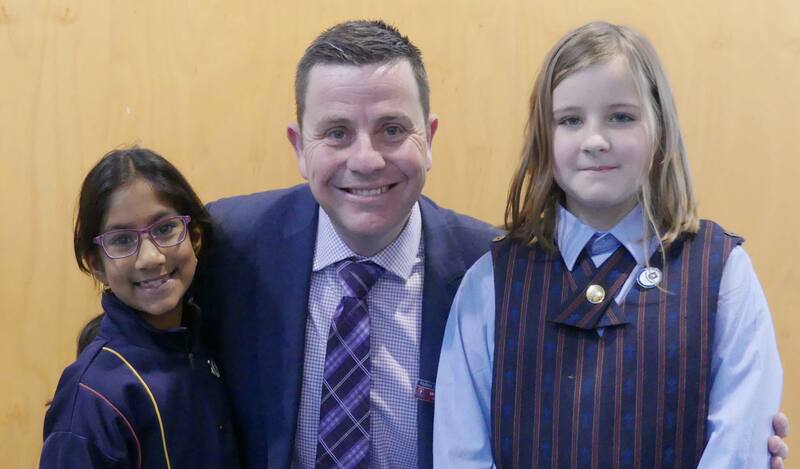 The foundation focused on the attitude of our young students compared to the rest of Australia, who had already been surveyed, and how they can safeguard against inappropriate interactions. Our students enjoyed the opportunity to openly discuss the issues that they are facing on a daily basis when they are online. The presenter commented on the mature approach of our students and was impressed at their level of understanding of rules and social norms. Please take the time to continually talk to your children about remaining safe online and report any issues immediately. The foundation also held a parent evening where, again, the issues facing young people were discussed and it was a real eye-opener for some parents as to what students are faced with online. A big congratulations to all the Year 9 students who completed the camp at Melrose. 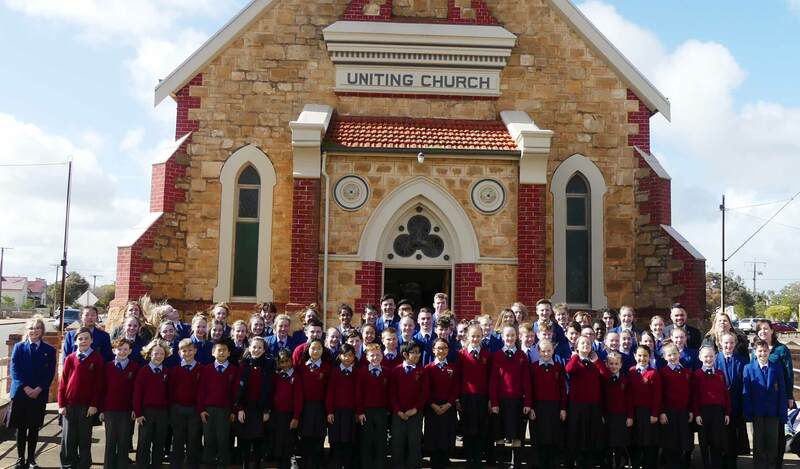 The photos did not do justice to the environment with the sun shining and so many students got to experience the great landscapes of the Flinders Ranges for the first time. 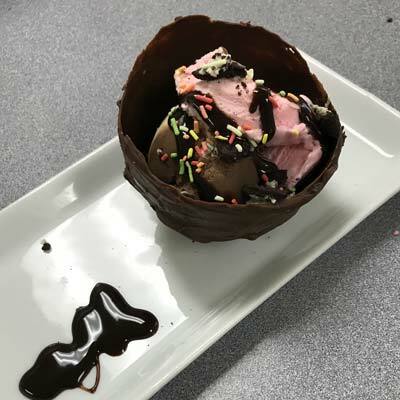 The cohort of students could not have provided any more positive feedback on the camp on their return and shared their experiences with the other Middle School students. The rain held off for all groups except those out on expedition on the final night, but even those who had to eat breakfast in a tent came back with glowing smiles! The new Pedare logo and marketing material will be arriving in local letterboxes soon! 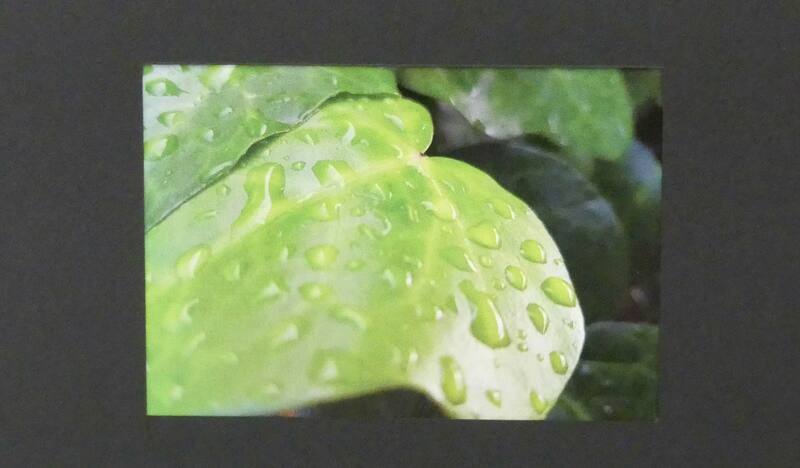 We are very happy with the images and are excited about sending the material out to prospective families. In 2019 the College will be offering 4 classes of Year 7 as opposed to the current 3 classes in 2018. 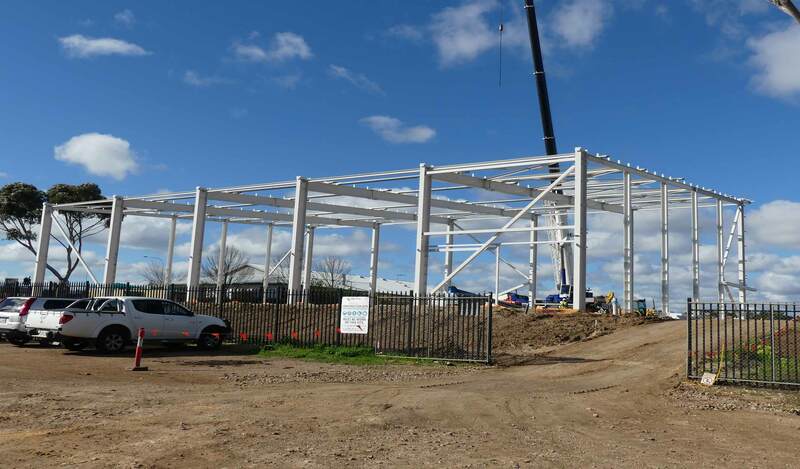 We are anticipating high demand for enrolments with the new Middle School and the new exciting and innovative learning spaces being built. If you aware of families who are looking to enrol at Pedare please remind them to contact Julie Holland as early as possible. Casual Day $2 donation supporting Backpacks 4 SA kids and Cure4CF. Already we are at the end of Week 4. 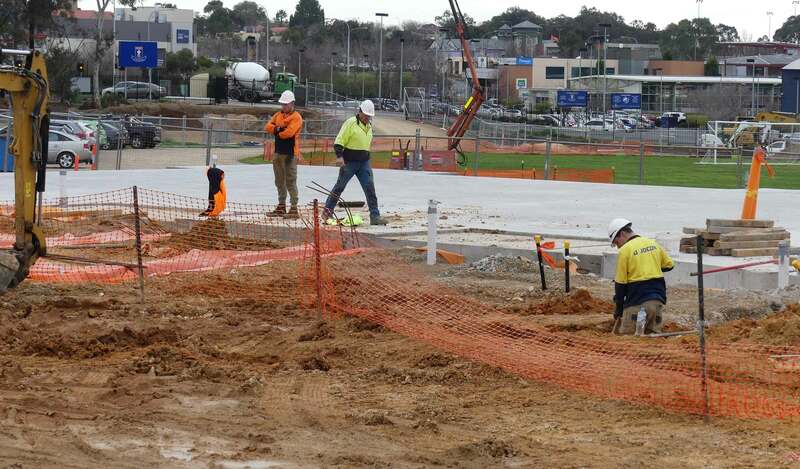 You know when the year is rushing to a close when the football finals are on the horizon; although sadly it seems it may be a quiet time for supporters of our Adelaide teams. However, this is not the case for our Year 12s, as they complete major assignments and begin to prepare for examinations and final assessment tasks. Our Year 12 English Literary Studies class experienced a first this week, as they sat their online trial exam. 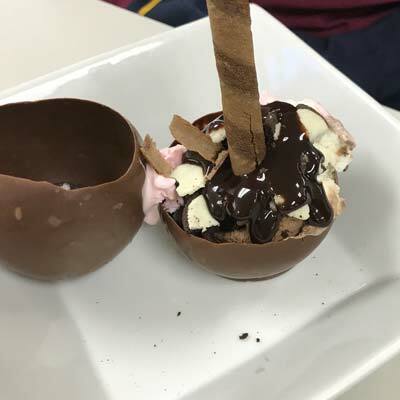 This is the way of the future for the SACE and thanks must go to our IT staff, Mr Cheel, Mrs Hollister and Mrs Tilly for all the work that went into preparing the students for this trial in readiness for their final online exam in November. Thank you to those Year 12 parents who took the opportunity to attend Parent/Teacher/Student interviews this week. It is so important to keep the lines of communication open between families and teachers, particularly as we move into the final stages of the students’ academic year. It has been our recent pleasure to conduct interviews for our 2019 College Captains. We were presented with a quality field of candidates and the decision was not an easy one. All applicants expressed a pride in the College and a willingness to serve our community. They were especially excited about the challenge of becoming One College and the opportunities it will provide. Congratulations to Brooke Carrigan and Connor Pullinger on their appointment as College Captains for 2019. 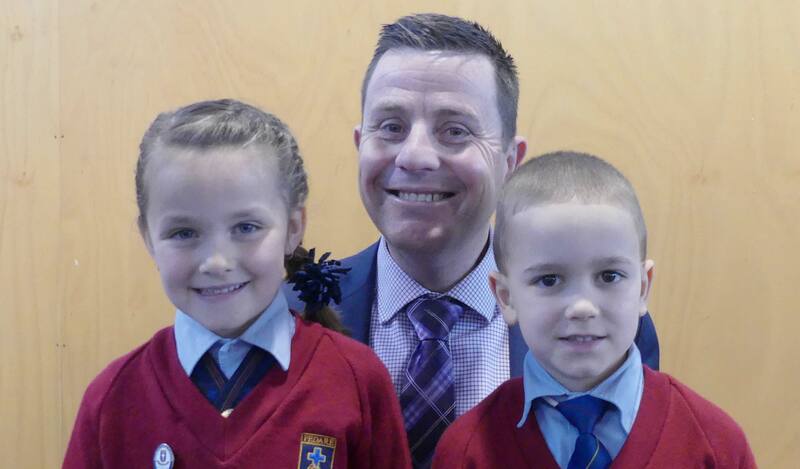 I know Mr Millard, Mr Whiteman and Ms Robertson are looking forward to working with them both next year. To those who were unsuccessful, I congratulate you on the quality of your applications and your interviews. I encourage you to look for opportunities to serve our community in other leadership positions or simply by continuing to be excellent role models for your peers and for our younger students, and as representatives of Pedare. Whilst the Year 12s have been encouraged to attend Open Days at our various tertiary institutions in preparation for completing their SATAC applications, the Year 10 and 11 students are busy selecting their subjects for next year. We look forward to meeting with them and their families at our up-coming subject counselling evenings: Year 10 in Week 6 and Year 11 in Week 7. 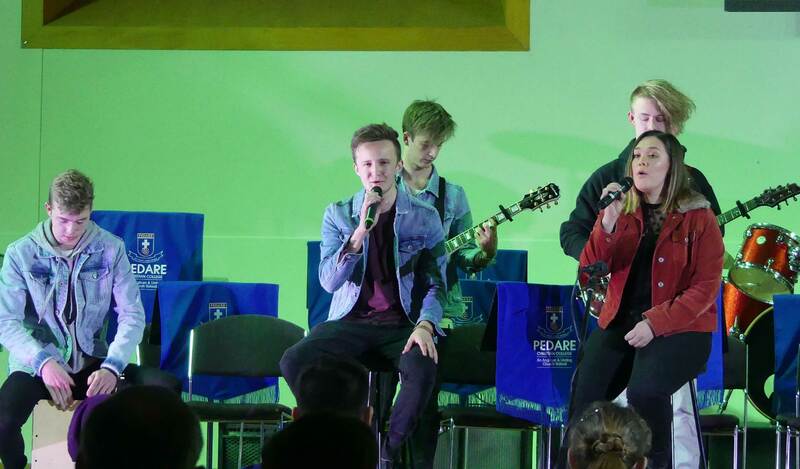 Once again, the recent Music Showcase evening lived up to its name as it showcased the many talents of our music students. The quality of performances and the enthusiasm of the performers made for a very enjoyable experience. 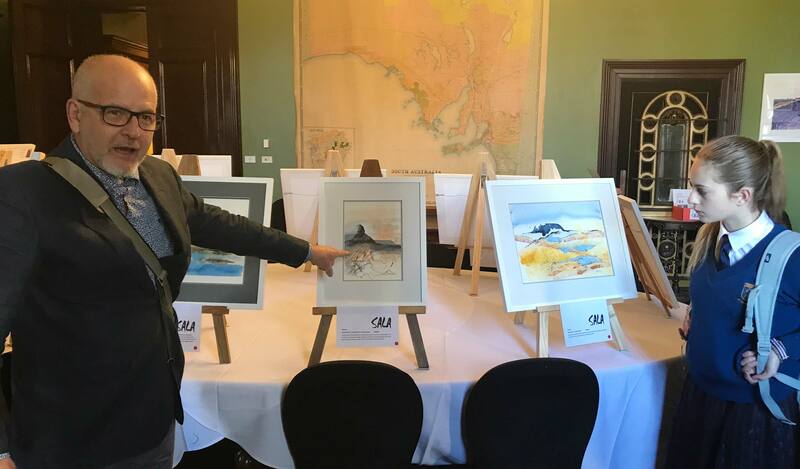 It was also great to see the art work of students across both Middle and Senior School, as they too showcased the development of their skills. 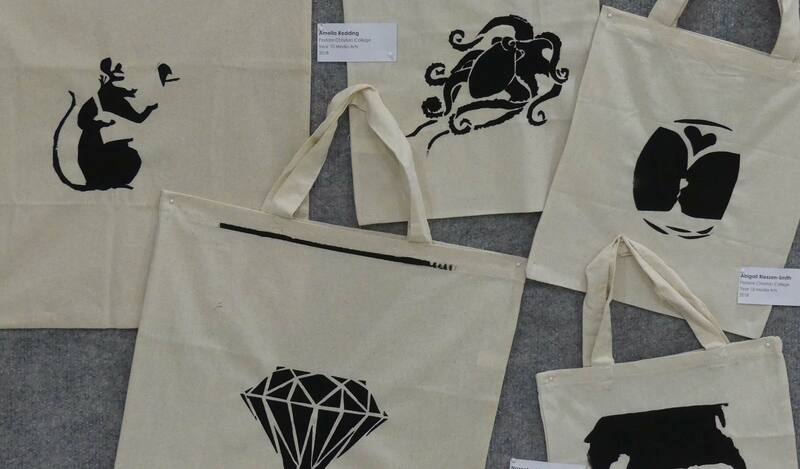 For the Year 12s it was their last Showcase and their effort over the years was gratefully acknowledged. The blossom emerging on the trees reminds us that despite the cold weather, the warmth of Spring is just around the corner. This can serve as a reminder to our Senior School students; that they must continue to stay focused and to endure the cold hard fact of having to work as hard as they can if they wish to reap the awards and bask in the warmth of success. 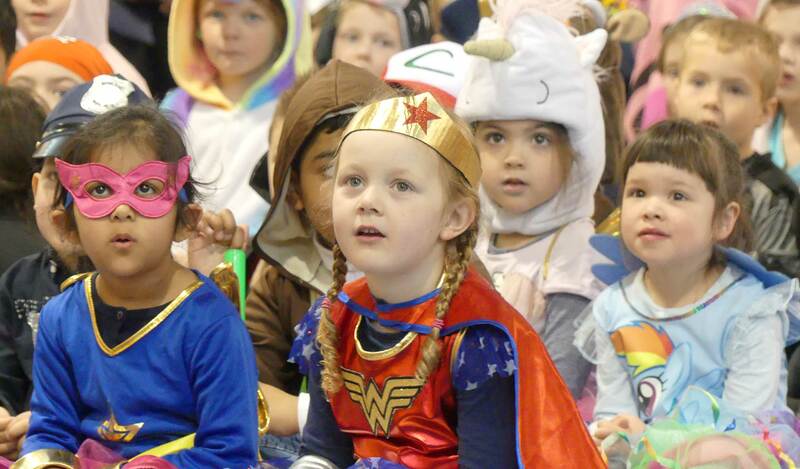 On Friday 17 August, the Junior School launched Children’s Book Week/ VIP Day with a Special Assembly. The theme this year was ‘Find your Treasure’. 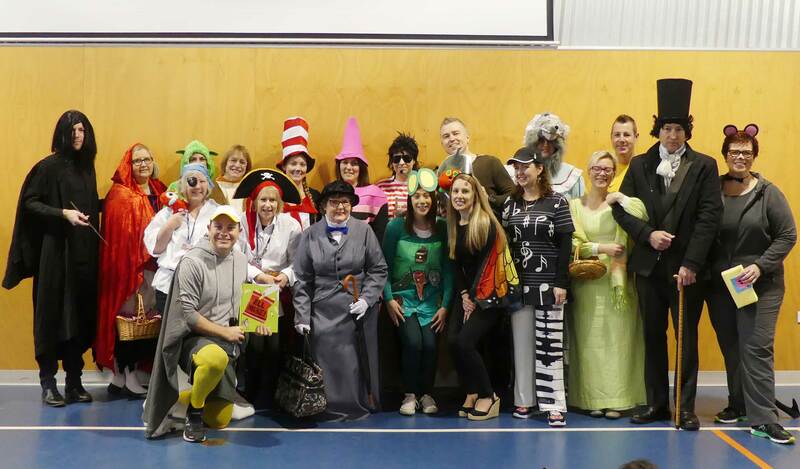 The teachers, students and their younger siblings came dressed as a character from a book they treasure. 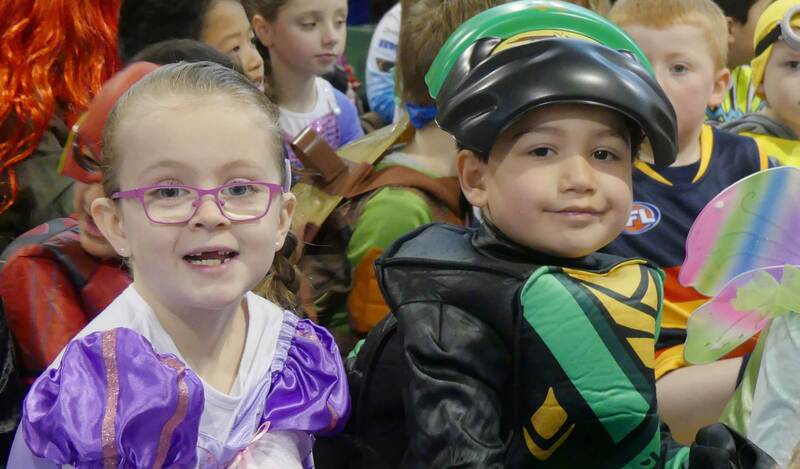 Students excitedly showed off their amazing costumes in the costume parade. 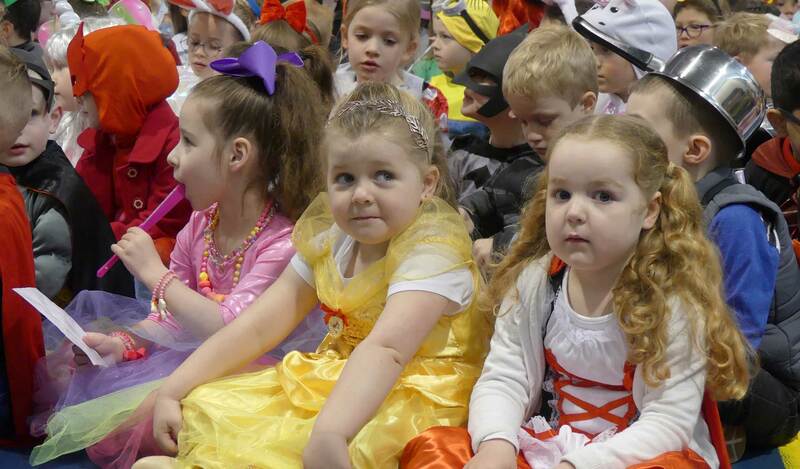 Thank you to parents for all your efforts in dressing your children for the event. One of the highlights of the Assembly was the book drama presented by Mr Pearce and Mrs Clifton. This year they performed ‘All Mine’ by Zehra Hicks. 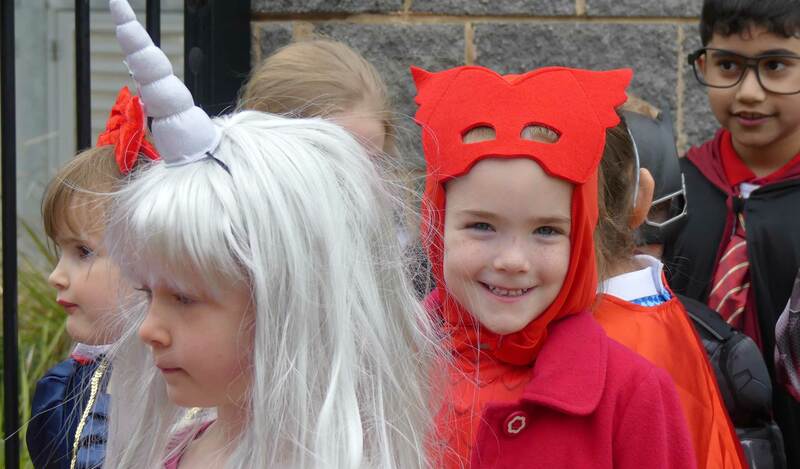 After the Assembly, each class and their VIPs explored the school to find the clues for their Treasure hunts. The final clue was a ‘Treasure Box lunch’. In the Box were pirate bananas, pirate mandarins and pirate apples, which the students enjoyed with their lunch. Book Fair was open all day for families to purchase good books and stationery treasures. 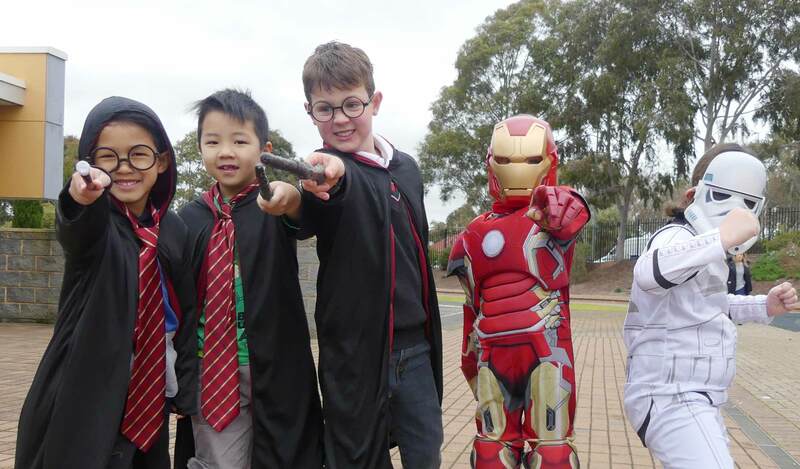 During Book Week, students will have the opportunity to participate in a Chinese Book Week Treasure Hunt on Tuesday, and to attend a performance of ‘Pirate Pip’s Party Show’ in the Library. 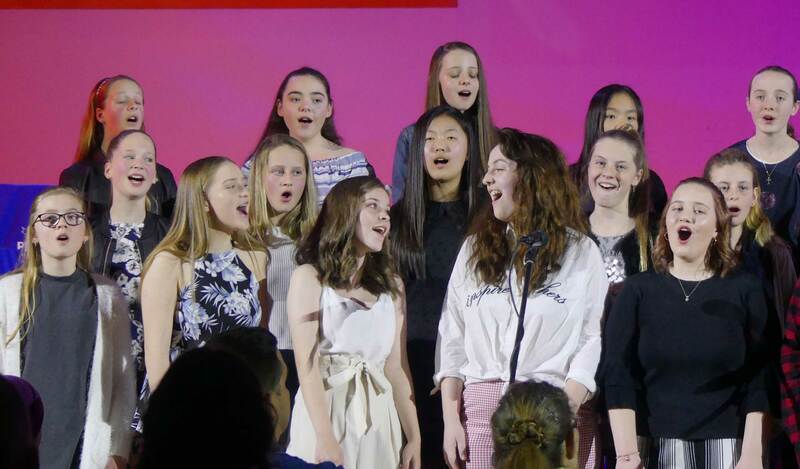 On Friday 3 August, the Junior, Middle & Senior Schools travelled to Balaklava for the annual 2018 Balaklava Eisteddfod. 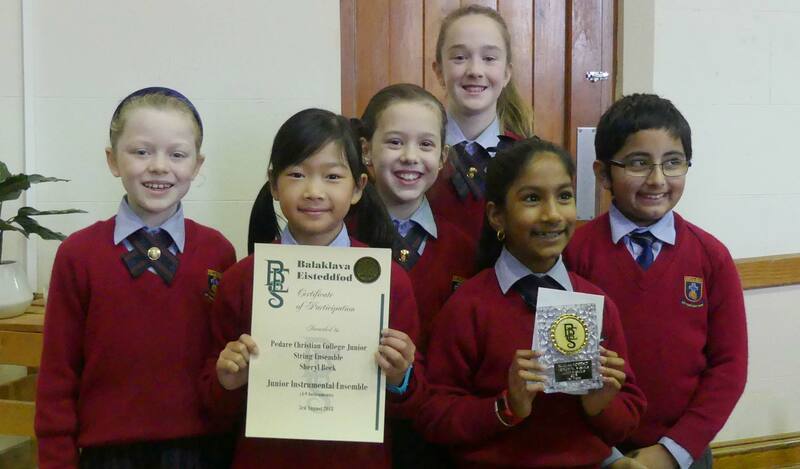 This was the first time the Junior School had been involved with this event. 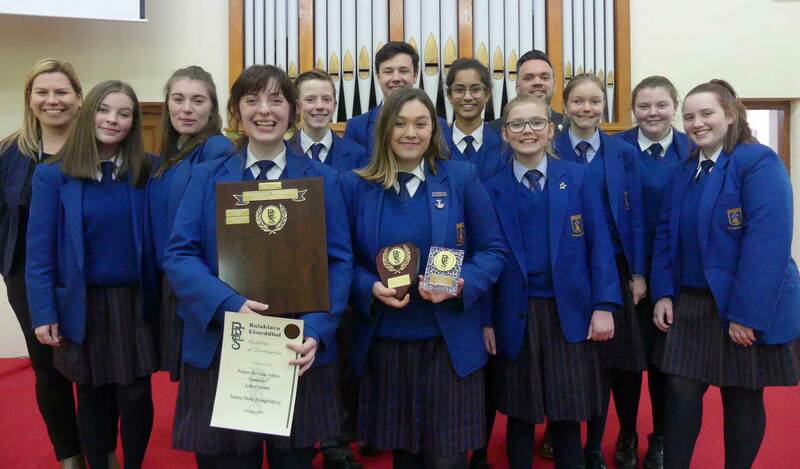 It was a very successful day with the Junior School String Ensemble and Luminaire Vocal Ensemble both winning a 1st place trophy. Luminaire were also Choral Champions of the day! 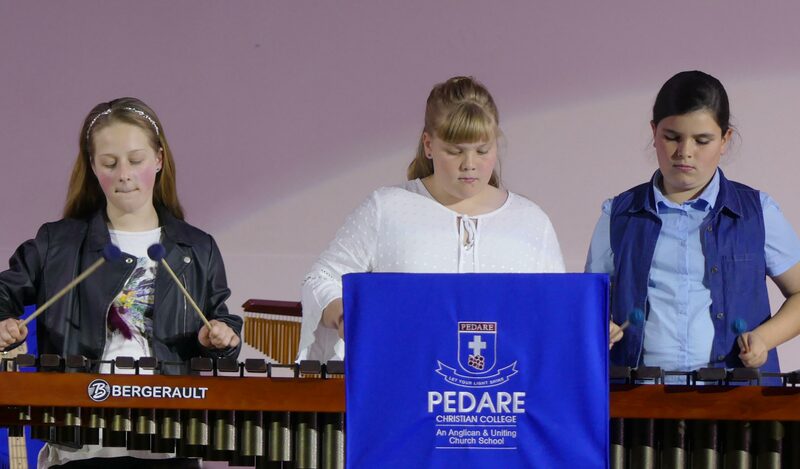 The Junior School Percussion Ensemble, Guitar Ensemble and Senior School String Quartet all received Honourable Mentions. With two big buses, it was our largest music excursion to date and everyone had a great time representing Music at Pedare. The talents of our Year 6-12 music students were well and truly on display at our annual Music and Art Showcase held on Thursday 9 August in the College Chapel. 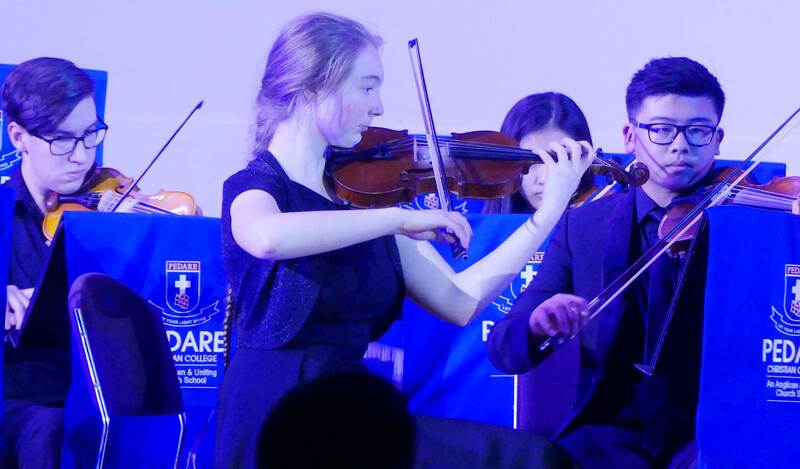 The audience was entertained by the wide variety of performances including Guitar and String Ensembles, Rock, Class and Senior Bands, String Quartets, Pedare Voices and the Luminaire Vocal Ensemble. 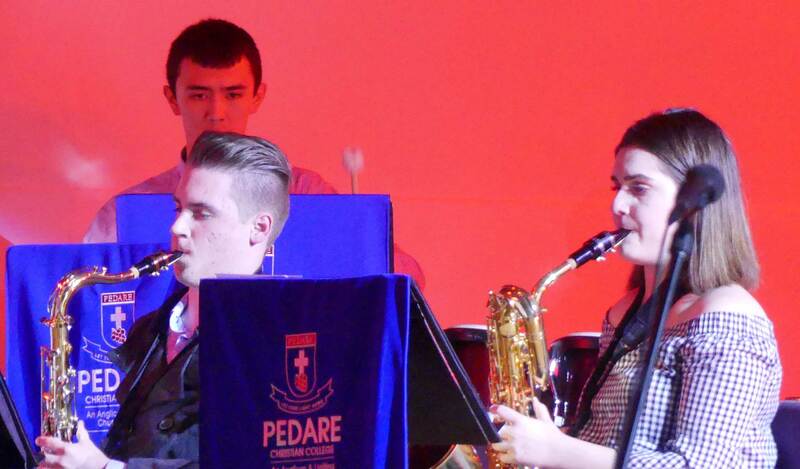 The students shone as they performed with passion, skill and enthusiasm throughout the evening. 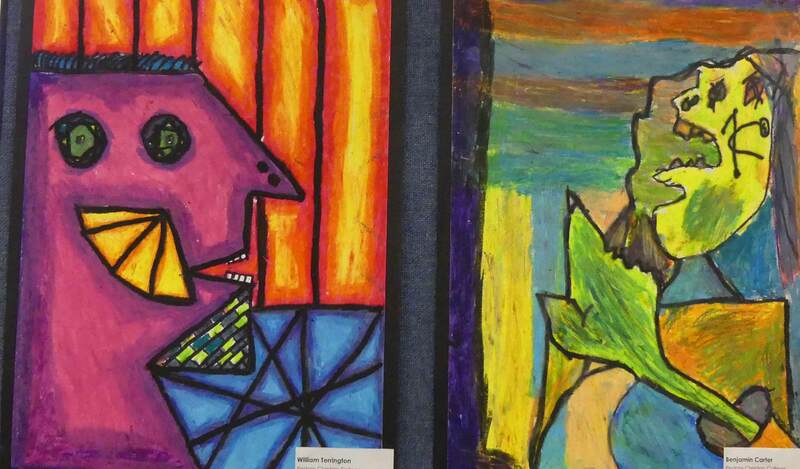 During Week 3 and 4 of Term 3, a selection of Year 6 to Year 12 student work was displayed in the College Chapel foyer. The exhibition was a huge success to acknowledge the talents of our art students and demonstrate the wide range of medium exploration provided at Pedare. 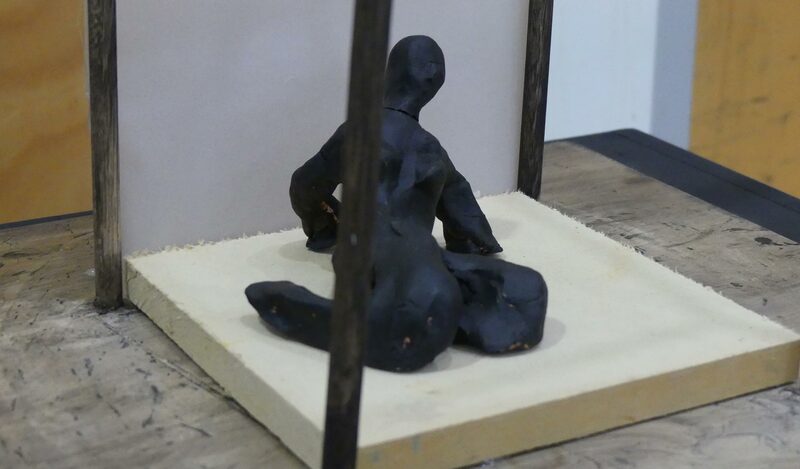 The exhibition included sculpture, photography, painting, drawing, printmaking and more. 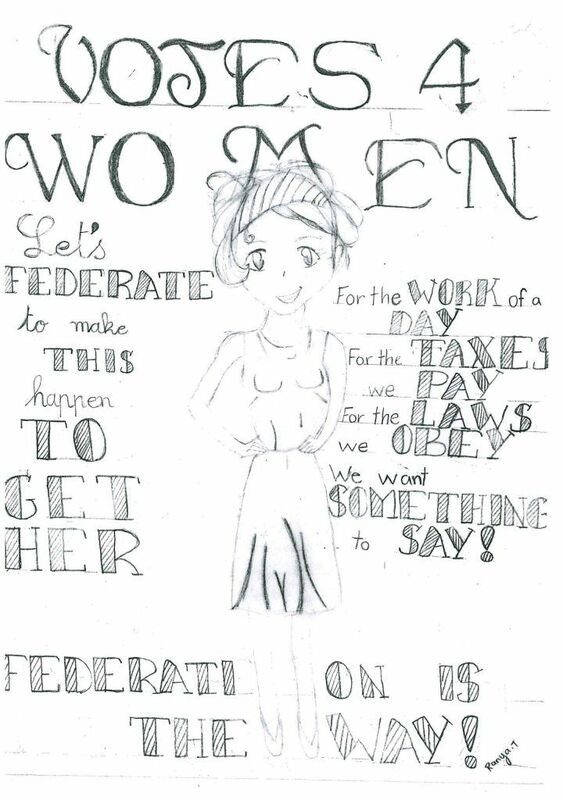 The artwork is the work of Ranya Tongaria (Year 6), completed as part of the Individuals and Societies: Road to Federation unit. This unit required students to specialise in one issue which contributed to the Federation debate. Ranya’s topic was Women’s Suffrage. Her poster beautifully encapsulates the poster style of the late 1800s with some compelling arguments in favour of women’s suffrage. Well done Ranya. Year 9 students are finalising their community project presentations, a result of 7 months of hard work. Students have been reaching out to the community fulfilling a genuine need, for example, collecting blankets for sheltered dog and cats, assisting the elderly or coaching a soccer team. Students are being assessed on the IB criterion on investigating planning taking-action and reflecting. The project has extended our students ideas about service learning, whilst developing their Approaches to Learning (ATL) of research, communication, self-management, thinking and social skills. As the projects wind down, we can applaud our students on their global thinking and care for others which has certainly extended their international mindedness, a foundational concept of the IB. 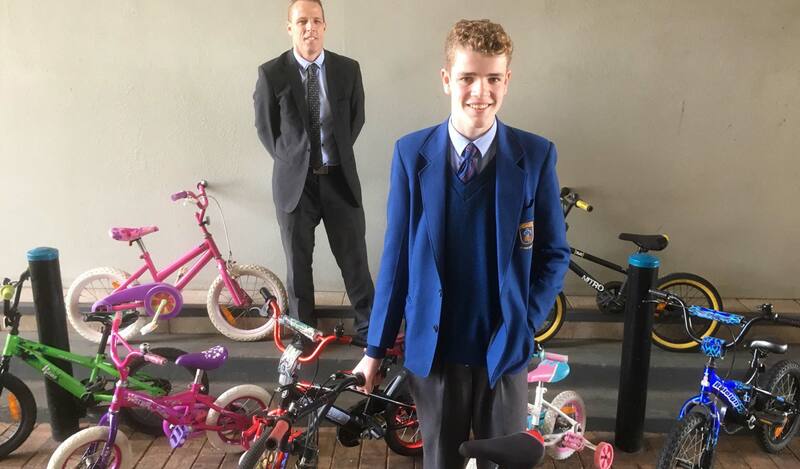 Jay Watson (pictured with his dad Mark) has restored 7 children’s bikes which will be donated to Anglicare, who will give them to a new refugee family in the area and provide happiness for some local children in need. All students are to be commended for their dedication to the local needs or issues of our community. 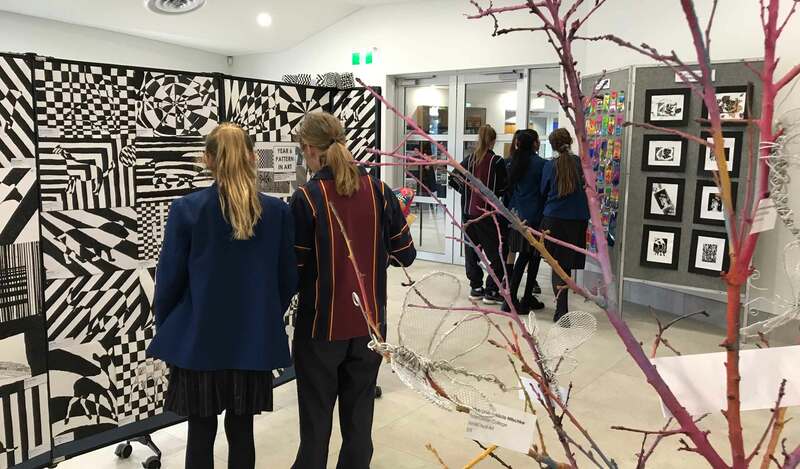 On Tuesday 14 August, Year 10 Visual Art and Media Art students visited three gallery spaces while on an excursion to the city. They viewed the landscape work of Mrs Karan Hudson (Pedare Junior School Teacher) on display at Adina Hotel in the Old State Cabinet Room, for the SALA Festival. 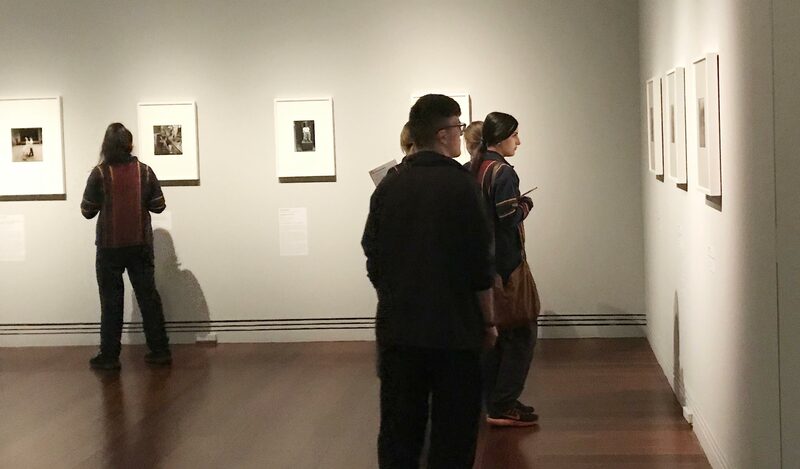 Students then explored the current photography exhibitions of Tracey Moffatt and Diane Arbus at the Art Gallery of South Australia. 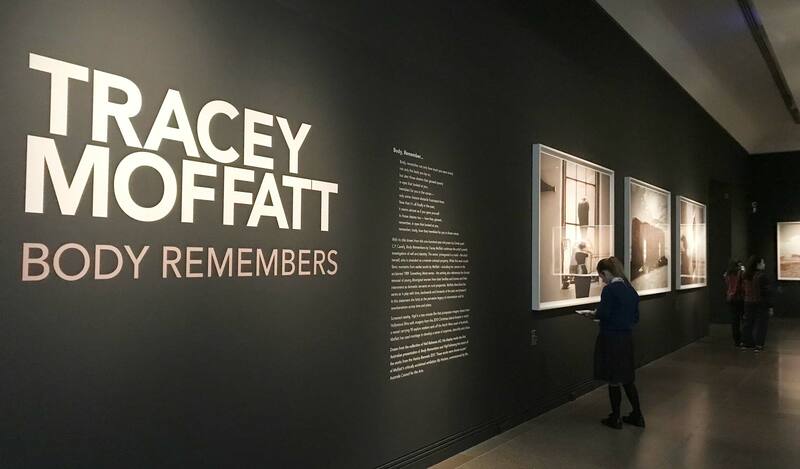 This experience provided the opportunity for discussion of Australian history and the stories told by Aboriginal artist Tracey Moffatt regarding the stolen generation and refugee crisis. At the Samstag Museum, students were given a guided tour with a thorough background into the symbolism of Aldo Iacobelli installation work. Students were very engaged and challenged by the meanings and messages of his artworks. 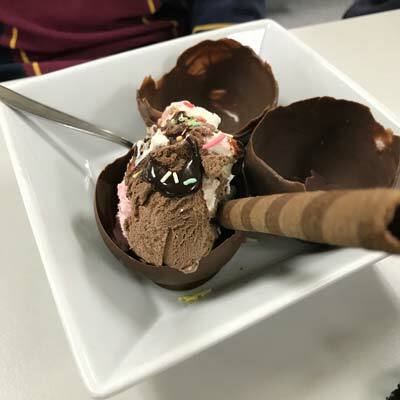 During Term 3, Year 10 Food Technology class has been experimenting with chocolate and have created some beautiful bowls using chocolate! 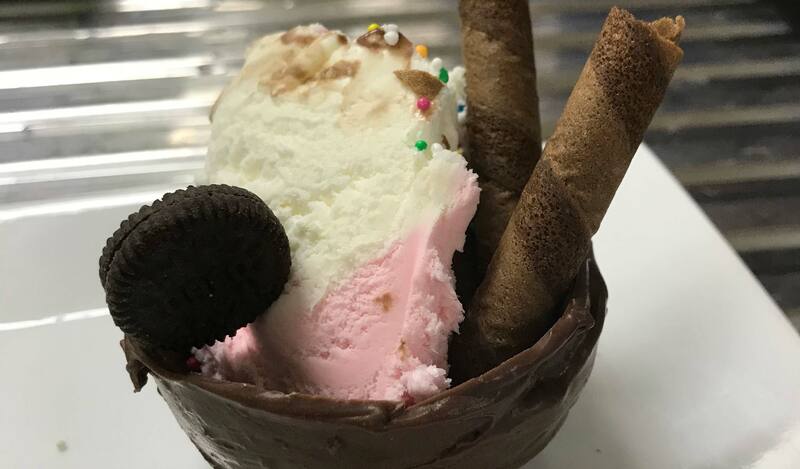 A positive attitude and gentle touch was the key to success in creating such a fun dessert. 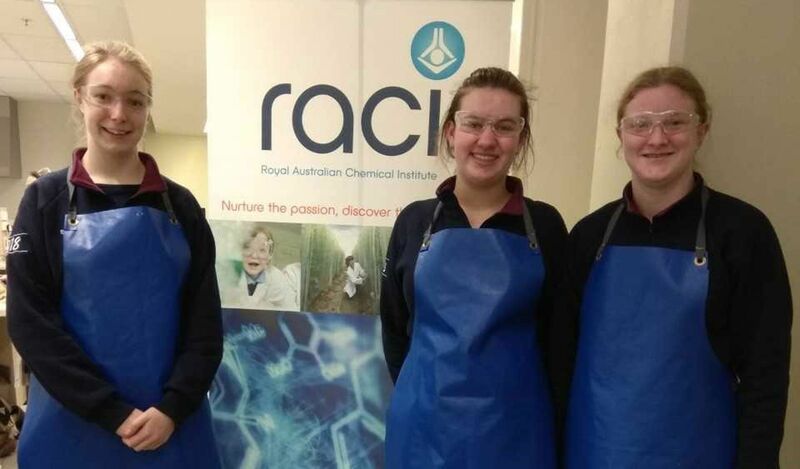 After getting through the first round of the Royal Australian Chemical Institute (RACI) Chemistry Titration competition against 400 other teams, Year 12 students Sophie Szabo, Stephanie Milanowski and Isobel Cassidy, competed in a tough state final against 30 other teams on Saturday 4 August at UniSA Medical Laboratories. Although the they did not make it to the national competition, Stephanie is to be commended on her fantastic results on the day. The girls highly recommend this competition to next year’s Stage 2 chemistry students. 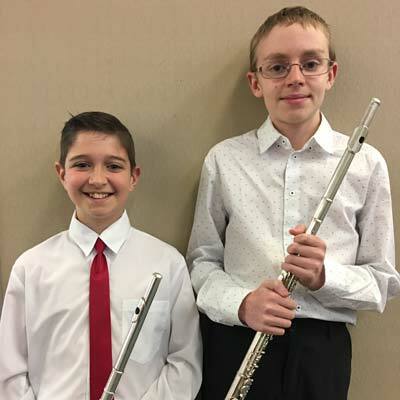 Congratulations to Thomas Brennan, Year 7 and Ashley Knight, Year 6, who recently competed together in the flute duet section of the Adelaide Eisteddfod. 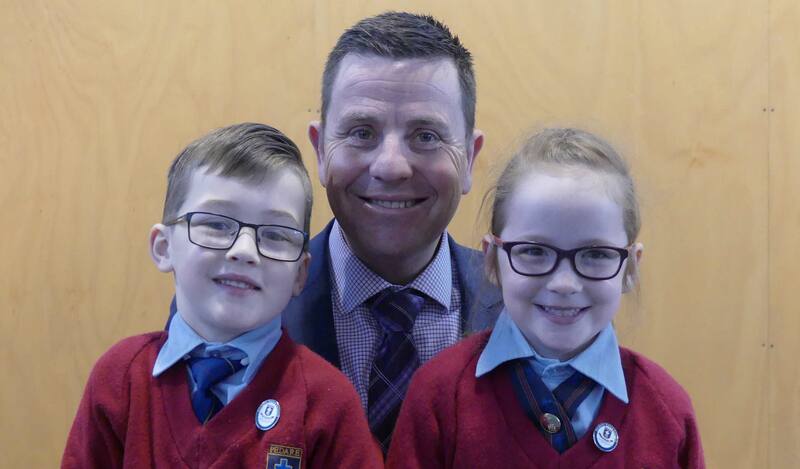 They came 3rd in the under Grade 5 category, with Thomas also receiving 2nd place in the open piccolo section and an honourable mention in both Grade 4 flute and Grade 6 piano. Well done Thomas and Ashley. 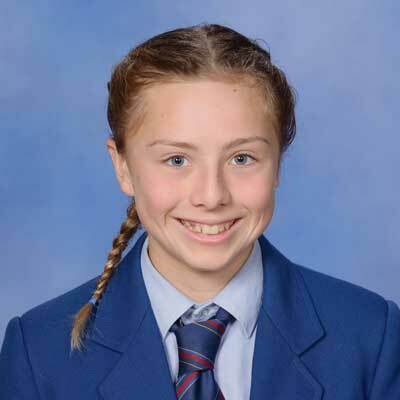 Madison Smith, Year 8, has been selected for the digIT 2019 program offered by the Australian Mathematics Trust. digIT 2019 will be held at the University of Western Australia and will ignite her passion for Information and Communication Technology (ICT). Congratulations Madison, we look forward to her sharing about her experience next year. 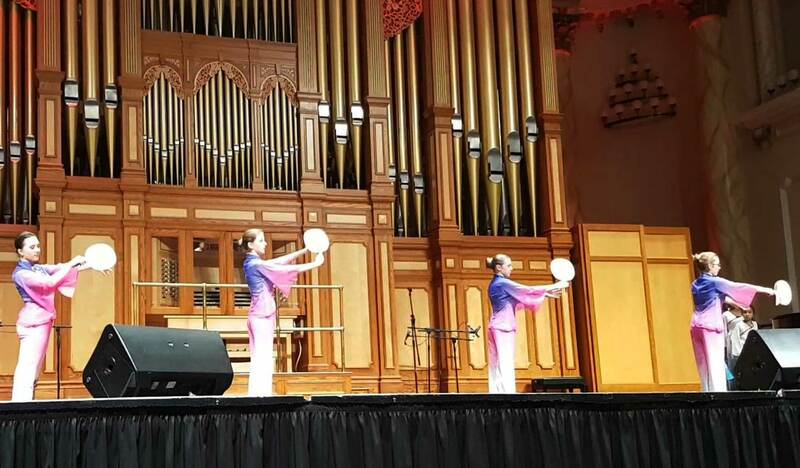 On Monday 6 August, Pedare OzAsia Club had the privilege of being invited to perform a Chinese folk dance in the closing ceremony of Xin Di Cup Modern Practical Piano International Competition at the Adelaide Town Hall, attended by Adelaide May Martin Haese. 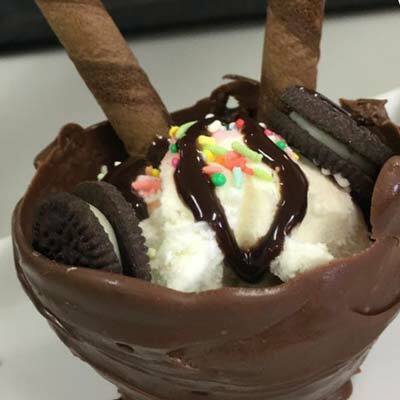 This was a great experience for our OzAsia Club students to be part of this event. Code Camps are back at Pedare for the October school holidays. 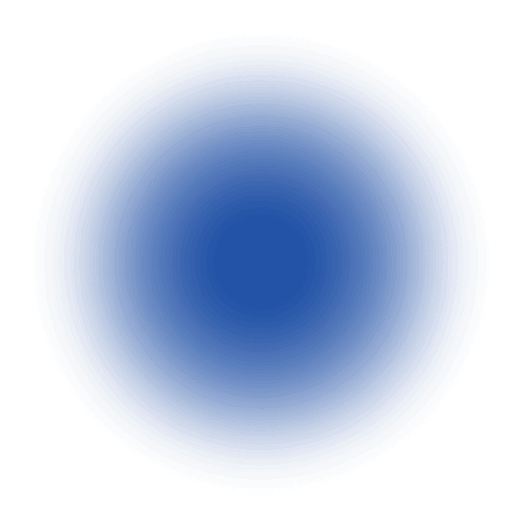 3 – 5 October. Our little coders make their first small but important leap from consumers to creators of tech. Build awesome mini-games and learn about coding using a mixture of iPad and physical based learning. Fun, engaging and challenging… and are our most known Code Camp that over 12,000 students have completed. Code Camp Spark is where every student in years 2-6 should start their Code Camp journey. Enrol and help your child become a coding superstar! For more information, visit codecamp.com.au Click here for more information. Meets Friday each week at 7:30pm. The next meeting is on Friday 24 August. Come for a great time of games, friendship and bible discussion. For information about 2018 SWAT Youth, phone Dave on 0403 723 953 or click here.